Russian Deputy Prime Minister Dmitry Rogozin promised to take revenge on Romania after its authorities did not let his flight to Chisinau enter its airspace. "Wait for an answer, bastards," he tweeted immediately after the incident. How can Moscow answer Bucharest? Rogozin, who is subject to EU sanctions, was planning to visit Chisinau first and then go to the breakaway Dniester region to attend the celebrations on the occasion of the 25th anniversary of the "peacekeeping mission". Officially, Rogozin was invited by Moldovan President Igor Dodon, who also planned to accompany him to Tiraspol. On the eve of the trip, the Russian official promised to fly to Chisinau on a military plane, which caused a big scandal in Moldova. 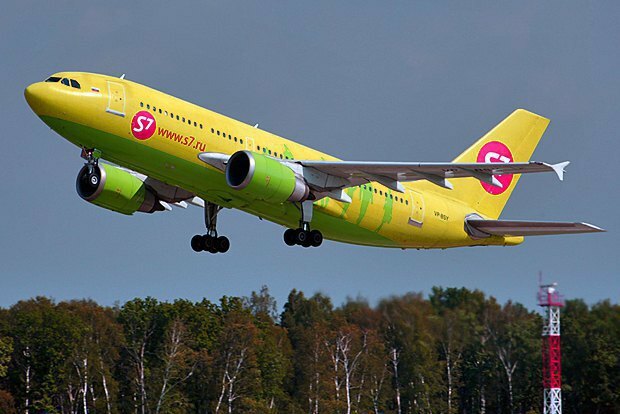 As a result, on 28 July, Rogozin boarded a regular flight by the S7 airline along with other passengers. The Russian official acted in a traditional "hybrid" manner (as advised by Russian President Putin) by standing "behind the backs of women and children". But when the plane approached the Romanian border, its authorities barred the plane carrying the official under European sanctions. As a result, the flight was diverted and landed in Minsk. After this Dmitry Rogozin tweeted: "Wait for an answer, bastards." Admittedly, Romania's decision is purely political. After all, earlier Rogozin had already flown this route (however by a charter plane), and official Bucharest did not mind. "The EU sanctions regime established by the Council Decision 2014/145/PESC of 17 March 2014 on restrictive measures against persons whose actions undermine or endanger the territorial integrity, sovereignty and independence of Ukraine does not prohibit persons on the sanctions list who are taking charter flights from flying through the airspace of EU member states," the Romanian Foreign Ministry said on 23 December 2016. 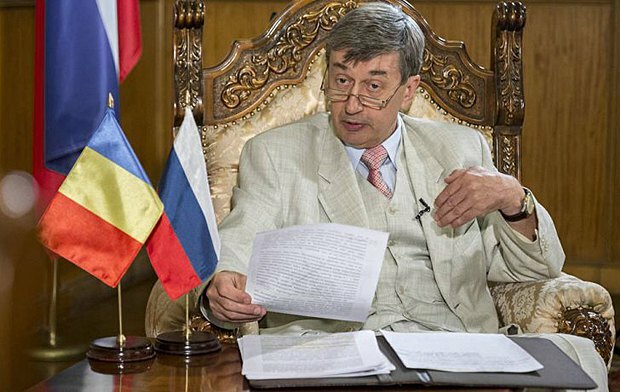 Apparently, Bucharest noted a specific feature of this Russian official: the countries he or his colleagues supervise are the first to face the problems of interethnic conflicts and integrity (Serbia, Moldova), coups (Montenegro) and even open wars (Ukraine). However Rogozin's last visit was equally political and provocatively demonstrative. The whole deputy prime minister was planning to celebrate what is in fact the occupation of one of the regions of Moldova, which is not only mentally and historically close to Romania, but now shares border with this NATO member state. Denying Rogozin an opportunity (as decided by the country's top leadership) to make PR on the sensitive for Romania issue can be interpreted as a message that Moldova and the Dniester region did not leave Bucharest's foreign policy agenda. To begin with, Romania, which has a strategic geographic location and US military facilities on its territory, and is currently the most loyal member of NATO and the EU in the region, is a concern for Moscow. However, despite all this, Romania was on the sidelines of Russia's foreign and economic policy. 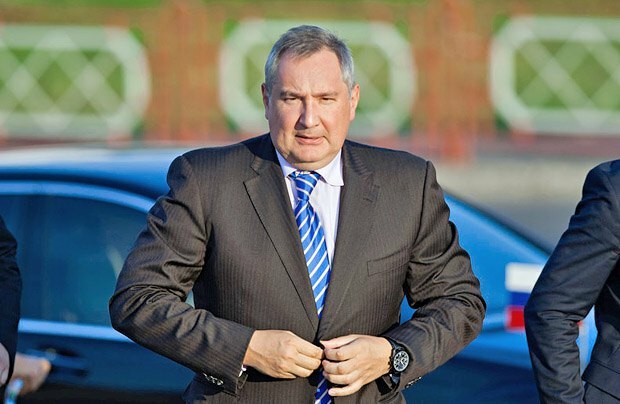 And it is because of the low level of contacts that Moscow's capacity to immediately punish Romania for the disrupted image tour of Dmitry Rogozin is more than limited. First, there is no shared border. Second, the level of trade and economic relations between the two countries is very low. Third, Romania is already a NATO member, which is another level of risk in the event of a conflict. The most the Russian authorities can do is to announce some symbolic personal sanctions against individuals directly involved in making this decision in the aviation sector. Only to keep the face. Therefore, Rogozin's verbal threats should be perceived as an emotional reaction of an unbalanced (or perhaps not entirely sober at the time of writing tweets) politician. Albeit a politician from a nuclear state. An additional confirmation of this can at least be the fact that a few days after the incident, Rogozin removed all the tweets about his conflict with the Romanian authorities. All his posts about the planned trip to Moldova have also been deleted. Rogozin even deleted his message to an employee of [Russian state-owned TV] Channel One, who was on the same flight, in which he called her "the fifth column". Rogozin said: "And now the fifth column exposed itself. You know, aunt Sveta, [Soviet spy book character] Stierlitz was never as close to failure". 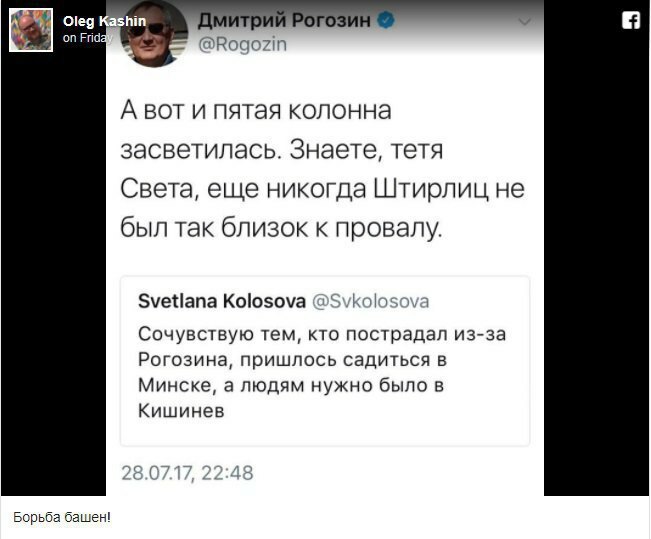 He was replying to a tweet by Svetlana Kolosova, who said: "I regret someone had to suffer because of Rogozin, we had to land in Minsk while people had to be in Chisinau." In the long term, Moscow will play dirty tricks on Romania while stepping up its ongoing information sabotage campaigns. For this it will use Romanian politicians and businessmen with business interests in Russia. Also, the Kremlin's favourite trick is to speculate on the ethnic issue. For Romania with its richly diverse ethnic communities and nationalities, some of which have separatist sentiments, the issue is more than relevant. In addition, Russia's traditional "allies" in any country are people dissatisfied with EU and NATO membership. A certain number of such citizens are in Romania. The usual tools for such work are the media and social networks. 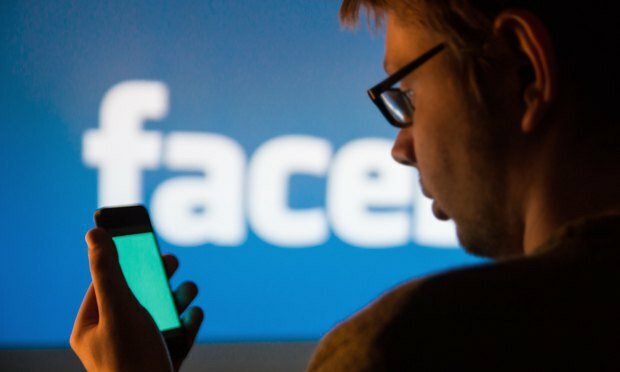 In particular, the Romanian segment on Facebook has about 20 pro-Russian groups (more than 50,000 participants) which are used to share pro-Russian information, ideas and values of the so-called "Russian world", promote a positive image of the Russian army as a "peacekeeping tool" and the idea of "invincibility" of Russian servicemen. These groups are also used to collect information about Romanians who feel unhappy about the domestic and foreign policies of the state. Here Romanians even get recruited into terrorist groups in Syria and eastern Ukraine. For example, several residents of the Romanian city of Suceava joined the ranks of terrorists in Luhansk and Donetsk regions. In addition to public instruments (mass media and social networks), Russia also actively uses certain ethnic groups to destabilise the situation in Romania and spread the ideas of the "Russian world". First and foremost, these are Rusyns and Lipovans (Russian Old Believers who, after the church reforms by Nikon, fled to the territory of the Moldavian principality and Bukovina in the 17th and 18th centuries. In Romania, they are considered a separate ethnic community). 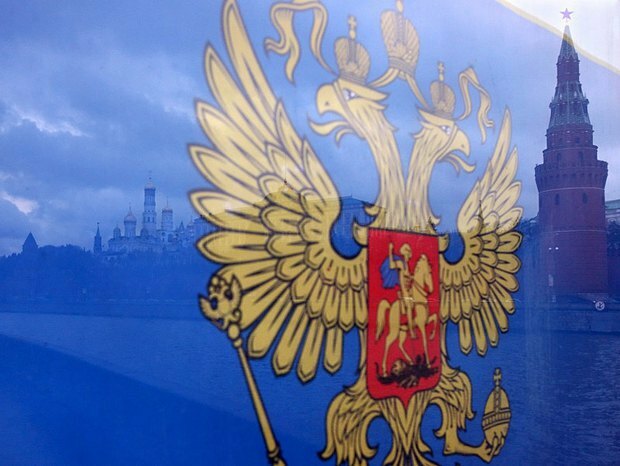 Russia's diplomatic staff in Romania, namely the embassy in Bucharest and the consulate general in Constanta, are "working" with them, fueling anti-Romanian sentiments. They sponsor cultural events in Romania which actively promote the ideas of the "Russian world" and organize Lipovans' and Rusyns' visits to Russia. However, activities by representatives of the Hungarian ethnic minority pose a special threat to the national security of Romania. While they are legally represented in Romanian public offices, many openly pledge commitment to Hungary's policy. Thanks to its Russophile Prime Minister Victor Orban, Hungary is known for its excessive loyalty even to the clearly destructive actions of the Kremlin. For Bucharest to effectively oppose Russian influence, Romania should be vigilant to fake news, attempts to cause panic and hostility in the public. Extremist organizations, which are prone to manipulation and can be bribed by Russian agents, must be under the control of state agencies. At the same time, it is necessary to monitor how the government and politicians are handling Russian money to prevent the scenario of neighbouring Eastern European countries from repeating.